Guitar #1, the Frankencaster, is mostly done. The theme of that build was to put together a guitar with Gibson Les Paul style pickups and electronics, inside a modified Telecaster body (tummy and forearm cuts), using a modern Stratocaster neck. Mission accomplished! The guitar stays in tune, it plays well, it cranks, and it distorts at the drop of a pick! Unfortunately, there is one teeny, tiny little problem. Regular readers of this blog know that I broke a strap holder screw off inside the hard maple body. So not only does the (heavy) guitar have no strap, but this blemish is eating away at me. I need to try to fix it. Thankfully, the folks over at http://www.tdpri.com/forum/index.php came to the rescue. One kind soul pointed me to this screw extractor kit and I have ordered the screw extractor itself. When it arrives, I’ll do an entire post about rescuing my guitar. But until then I had so much fun working on the Frankencaster project that I am going to do a second guitar project. I will build another Telecaster. This will be more traditional, with two single coil pickups in the standard config, using standard body routing, but there will be a couple of twists. First, I plan not to use a pickguard so I’ll need a nice looking body, and second, I want to experiment a little with the pickups and the wiring. Before I go into detail on the wiring, I want to show you the two pickups I plan to use. Seymour Duncan makes a nice set of noiseless pickups designed to produce a vintage Tele sound – the Vintage Stack set. Now these are good pickups but they won’t offer humbucker levels of signal strength and nor should they – that isn’t their design point. But what if I wanted a little more? What if I wanted it all? 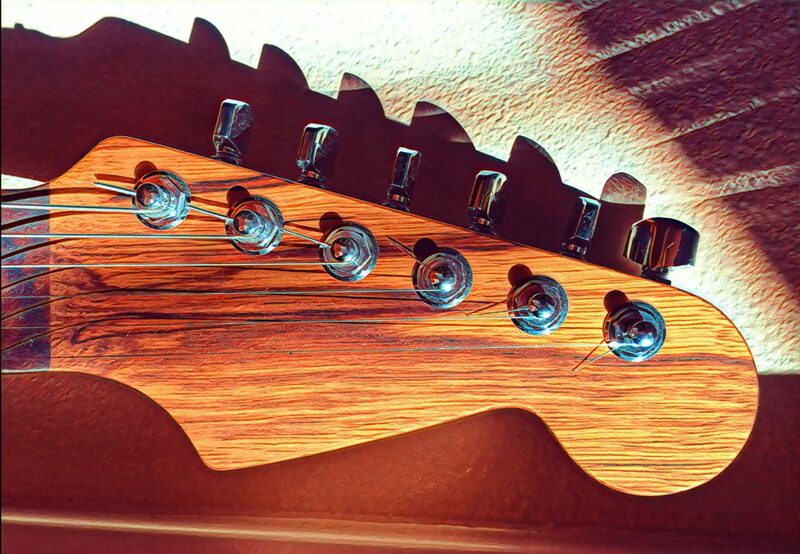 This leads me to my next point – Telecasters traditionally use a three position rotary switch to select between the neck pickup, the bridge pickup, and both pickups. And when this three position switch is set to “both pickups” it is operating the pickups in parallel. This is a fancy way of combining the signals to get a slightly different sound or tone. Note that it does not literally add the signals together – the combined setting is not louder. Here is a typical three position switch. In fact this is the one I will be using in my next guitar. The basic idea is pretty straightforward – as you slide the selector lever, it connects various leads on the switch underbelly. In the photo, it is connecting the first and last lead, for example. Well, thinking about all of this, I had the idea that I wanted to try and make an artificial humbucker by combining the neck and bridge single coil pickups into a single pickup like a humbucker, generating the signal strength a humbucker would yield. But even more interesting, unlike a regular humbucker, in which the pickups are separated by less than an inch, the single coil pickups on a Tele are separated by approximately four inches. So that will also affect the tone. But how to do all this? The standard wiring pattern for the Tele won’t work – it combines the pickups in parallel. I need to combine them in series – one pickup feeding its signal into the next pickup. It is very similar in theme to my wiring diagram for the Frankencaster but with the addition of the three position switch and only one volume/tone knob set. To help convince myself this diagram is correct, beside the switch I labelled what will be connected in each of the three positions (“N” or neck, “M” or middle, “B” or bridge). So for example, when the switch is in the “N” or “neck” position, the switch will connect leads 0 and 3 on the right side and leads 2 and 3 on the left side. When in “humbucking mode” or the middle position, the switch will connect leads 0 and 2 on the right and leads 1 and 3 on the left. You’ll note the capacitor in light blue ink. This is there because I looked at some StewMac standard Telecaster wiring diagrams and they all put a 0.001 microFarad capacitor in this spot. The Seymour Duncan standard Tele wiring diagrams don’t include this cap but I added it to the diagram to keep track. I’ll try it out and see how it affects things. The ostensible reason for adding this capacitor is to implement what is called a “treble bleed” circuit. With single coil pickups, it is often the case that as the volume for a pickup is turned down there is a loss of treble which occurs as the volume reduces. Adding this capacitor implements a parallel RC circuit which, as was described in the Frankencaster post linked just above, creates a filter, the precise nature of which is determine by the resistive and capacitive values in the circuit. The function of this filter is to filter out some of the lower frequencies, some of the bass. The effect is intended to be that the signal remains bright as the volume is lowered. We’ll see how it works. I may put together the guitar without this cap and then add it later to try to ascertain precisely how much impact it has on the tone. Next: Next post: What is guitar #2?